Pegasus professor Reed Noss stands on a wooden footbridge over Joshua Creek in Florida’s Charles H. Bronson State Forest, a nearly 11,000-acre preserve north of Christmas. It’s quiet and wet here — a good place to spot otters playing or an Eastern coral snake sunning. Noss is fond of the creek, but he’s more partial to the dry, pine-dotted flatwood not far away. It may not look like much at first glance, but the Davis-Shine Professor of Conservation Biology sees more than pine trees. He knows the backstory and context. Those trees are actually longleaf pines — an estimated 95 percent of which have been lost in Florida due to more than a century of logging and replanting with faster-growing slash pines. When such artificial shifts are forced, he says, “Decades of active management are needed to get it back. Noss wanders lands like this regularly. “It’s a civic responsibility, but it’s also something I use to inform my research,” he says. He is one of several UCF researchers working to better understand Florida landscapes and wildlife so the most critical natural areas of the state can be protected and managed effectively. 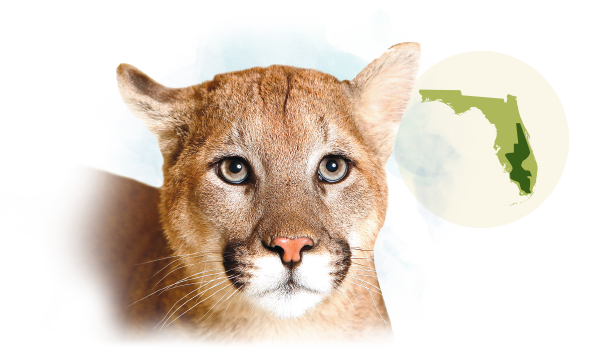 According to these experts, growth and development in Florida are inevitable, but widespread harm to Florida’s critical habitats, plants and wildlife doesn’t have to be. 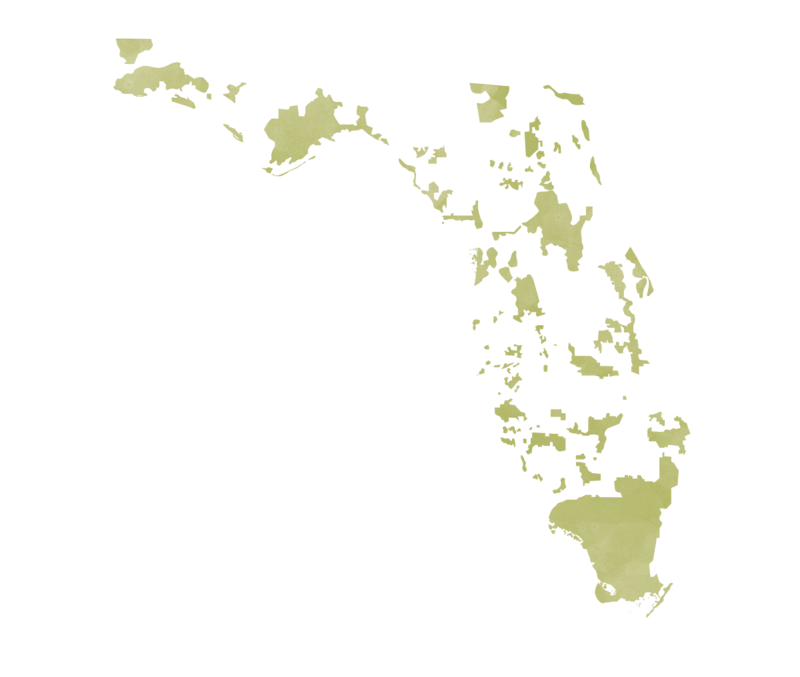 Florida hasn’t set an official goal, but if you look at most of the scientific studies around the world you need 50 percent [of land closed to development] to reach well-accepted conservation goals. 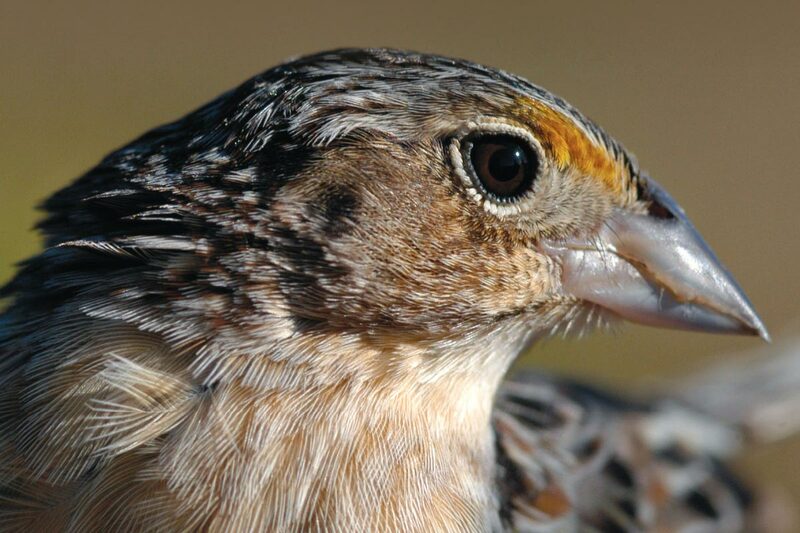 The Florida grasshopper sparrow, endemic to the dry prairies of South Florida, is among the most highly endangered birds in the continental United States. 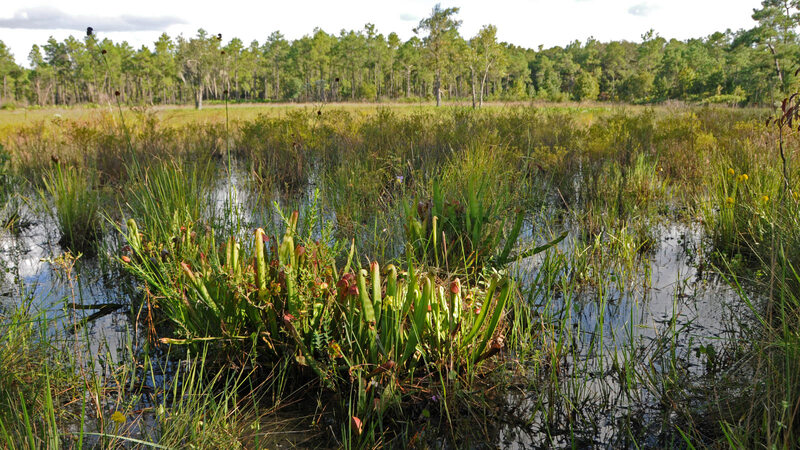 According to the Conservation Trust for Florida, over the past three decades, Florida has used science to protect more land for conservation than any other state, but it also has a long history of rapid population growth and development. 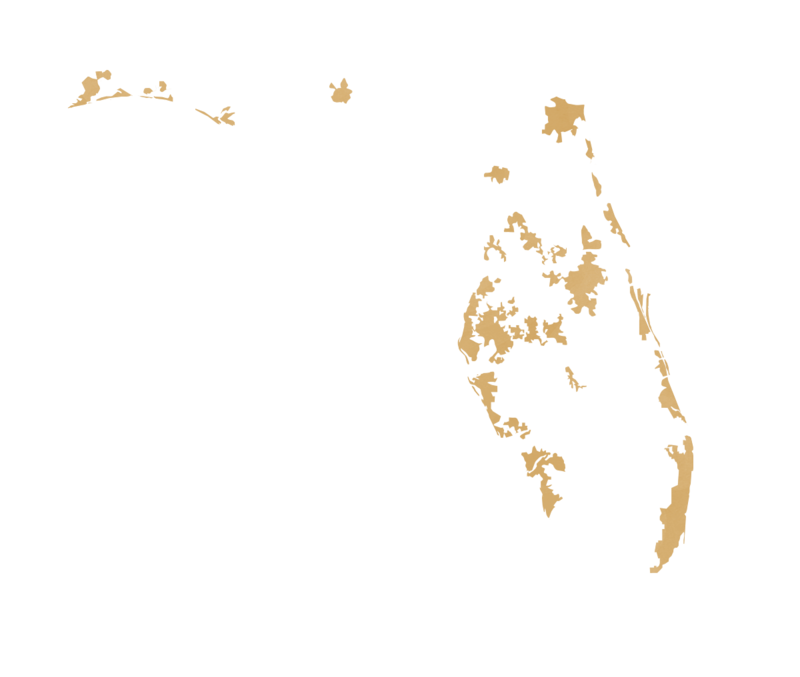 To date, most of Florida’s population growth has been in coastal areas, which is why roughly 80 percent of the state — mostly interior lands — remains rural, including both natural areas and ranches. But only about 25 percent of the state is effectively closed to development. 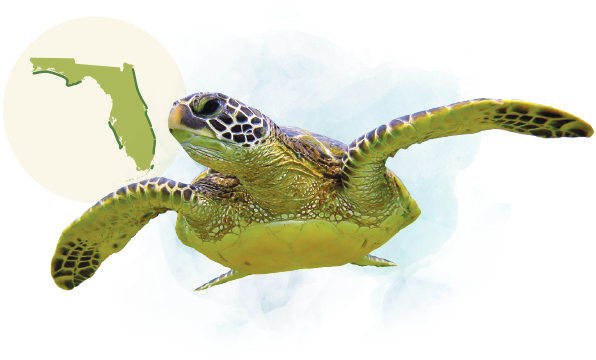 “Florida hasn’t set an official goal, but if you look at most of the scientific studies around the world you need 50 percent to reach well-accepted conservation goals,” Noss says. That’s why for much of Florida’s land deemed essential, researchers and managers push for conservation easements of existing ranches rather than outright state ownership. This involves owners selling off their right to develop their land, but maintaining their rights to ranch and live there. This offers a major financial incentive to owners, many of whom might otherwise be tempted or even forced to sell to developers as taxes rise with property values. Easements also mean major tax reductions because rates are set according to property values, which drop once development rights are sold. When development does move forward, researchers like Noss can help guide the process for landowners open to reducing impacts. He was called in recently to provide scientific input on plans for massive development of the roughly 300,000-acre Deseret Ranch, located west of Melbourne and currently owned by The Church of Jesus Christ of Latter-day Saints. Recommendations from the committee — composed of Noss, a representative from an environmental group and one person who works for developers — were unanimous, but they were not legally binding and ultimately weren’t incorporated into development plans. That kind of outcome is especially distressing when such large chunks of the state are in play. 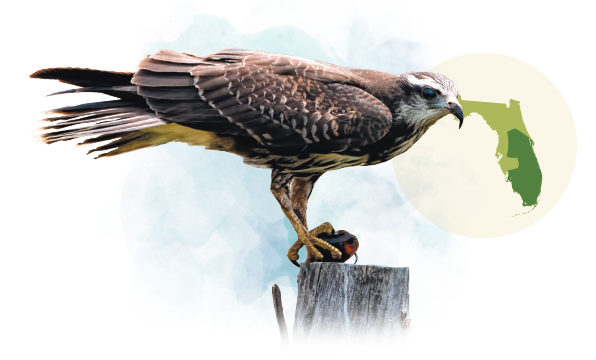 “We’re really killing the last remaining large-scale connections between North and South Florida,” says UCF Biology research associate Dan Smith, who works with Noss. “That is a very damaging trend,” says Noss, who was one of the first scientists working to identify lands most critical for keeping different areas connected throughout the state. 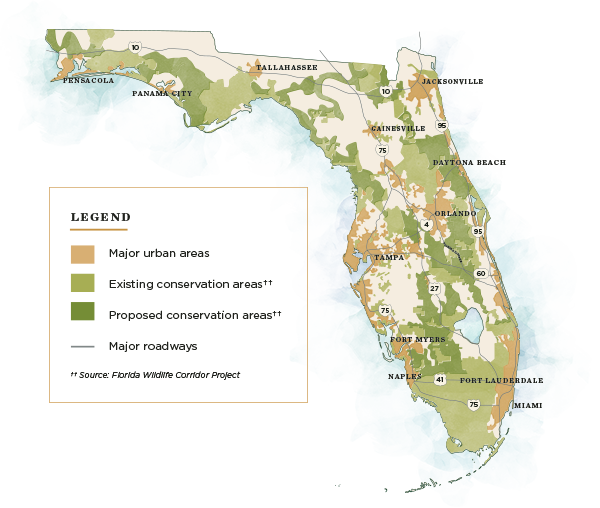 Numerous other researchers have done vital work, and nonprofits such as the Florida Wildlife Corridor and Conservation Trust for Florida are pushing for preservation of crucial land tracts. While larger land parcels typically get the most attention, Noss says that more isolated land parcels can also be essential, particularly in protecting animals that don’t roam far and certain plant species. “These large connected landscapes are critically important, but smaller areas are packed with rare species found nowhere else,” he says. 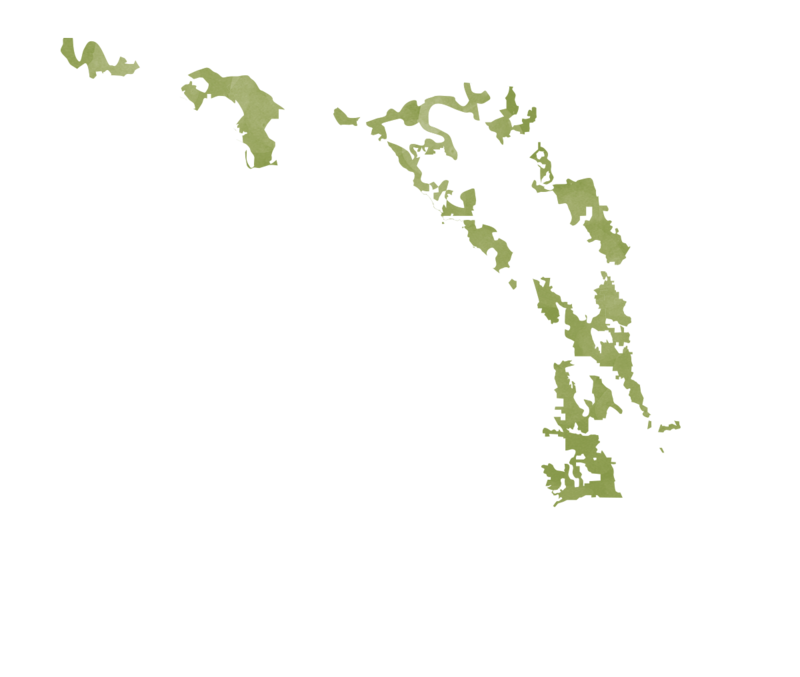 Florida has a long record of land conservation through programs such as Florida Forever, under which Joshua Creek was protected after Noss voted for it while a member of the program’s advisory board. We still have a tremendous need, especially given the rapid growth of development. 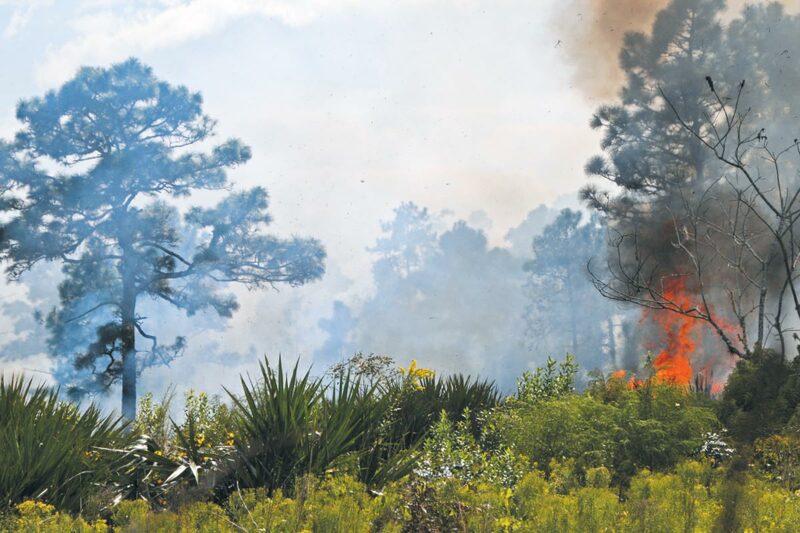 Even when land is protected, managing it in ways that maximize its benefits for Florida’s plants and animals remains a challenge, especially when it comes to fire, which is essential to ecological health. Fires started by lightning have always been a component of natural land cycles and provide multiple benefits, including clearing out underbrush to allow for more open, sunny conditions, which mean less competition for shrubs. Today, fires that start naturally are usually put out as quickly as possible to save homes and people, so managers instead rely on intentionally started, controlled burns to achieve the same land benefits. For about 20 years, UCF professor of biology Pedro Quintana-Ascencio has been analyzing the fire conditions essential for supporting endangered plant species. Quintana-Ascencio allows that most people are not going to appreciate the inherent value of an endangered plant species like his personal favorite, Hypericum cumulicola, also called the highlands scrub St. John’s-wort. “To be fair, these are not wonderful, flowering things,” he says. But when people understand that Florida hosts dozens of endangered plant species with important ecological roles, some found nowhere else in the world, he says they better appreciate their value. Many animals also depend on fire. There are fewer than 200 Florida grasshopper sparrows in the world, and they’re all in Florida. Researchers have found that for them to successfully breed, they need prairie land that hasn’t gone more than 24 months without a burn. “It’s not just aesthetics,” says Noss. “If you don’t burn enough, and you don’t burn during the right time of the year, you do lose species. It’s still possible the grasshopper sparrow can recover, but it’s getting more difficult.” Other species like fox squirrels are declining because they need a large habitat, and they can’t thrive in land that’s grown too shrubby due to too infrequent fires. Researchers such as Quintana-Ascencio also try to make it clear that humans benefit directly from fire. Frequent enough controlled burns dramatically reduce the likelihood of uncontrolled fires. Quintana-Ascencio has done much of this work — which includes developing and fine-tuning elaborate computer models to assess the benefits of different burning schemes — in collaboration with scientists such as Eric Menges at the Archbold Biological Station in Venus, Florida. Menges says such modeling work is critical to proper fire planning as well as assessing the potential impacts to future changes and challenges. One of the greatest challenges in fire management is, again, population growth, which reduces the areas that can be burned. If land is close to neighborhoods, then it is challenging to ensure that homes aren’t damaged or that smoke won’t cause problems on roads or for people with respiratory issues. “I’m hoping that we as a society can have a better discussion about the best way to proceed because fire is something we need,” Quintana-Ascencio says. A controlled burn near Joshua Creek in the Charles H. Bronson State Forest helps clear underbrush. Smith, whose research on bears has gained recent attention, has studied how encroachment affects wildlife populations, in part to enable recommendations on the best ways to minimize harm. One area of particular interest has been roadkill. “The impacts are a lot worse than most people thought,” he says. Everyone notices larger roadkill, such as deer, but countless reptiles, amphibians and other animals are also killed, especially around wetlands and other animal-rich areas. “You can count thousands of roadkill in just a single year in these areas,” Smith says. 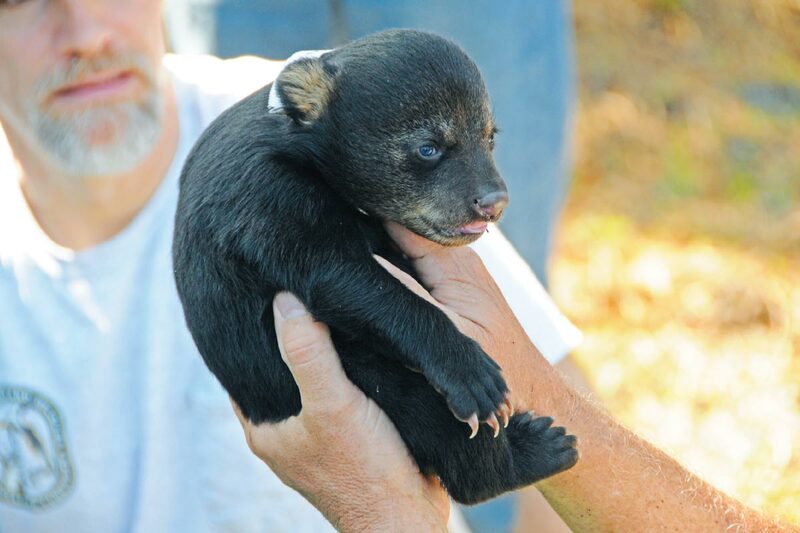 Researchers measure a black bear cub, about 6 weeks old, taken from a den at Rock Springs Run Reserve as part of a study supervised by the Florida Fish and Wildlife Conservation Commission. That work highlights the importance of proper road planning. Both federal and state regulations require minimized impacts on federally listed threatened and endangered species, as well as compliance with the Clean Water Act. If federal funding or federal land is involved, additional reviews are required. Smith says such regulation has led to many more progressive transportation projects in the state, but beyond strict compliance, there is always a balancing game between politics, cost and environmental protection, with priorities often changing from one part of the state to another. Though there is great research interest in interior lands, Noss also studies the role that land preservation can and should play in preparing for future sea level rise in Florida. Because so much of Florida is low-lying, large swaths of land can be easily inundated as the sea level rises. Among other effects, coastal properties can become more difficult or impossible to insure, which Noss says is likely to encourage or even force some migration of Floridians further inland. That combined with normal growth pressure may have huge impacts on wildlife because of the associated need to develop more inland area, requiring a new level of planning. UCF is well positioned to provide science-based guidance to governments and developers on how best to manage not just sea level rise threats but the full range of biological and human impacts related to coastal development. That’s thanks to the recent creation of UCF’s Sustainable Coastal Systems faculty cluster initiative, which fosters collaboration between faculty from different disciplines. 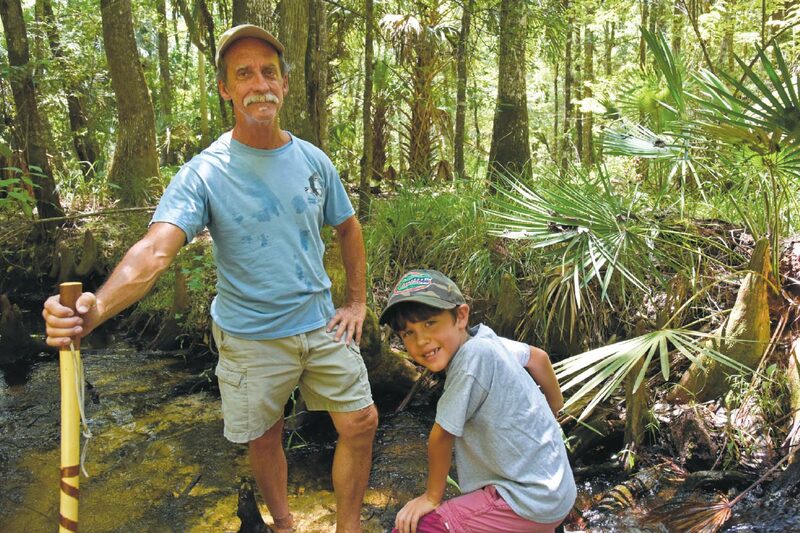 Noss and his grandson Kai explore Mills Creek near Chuluota, Florida. What’s at stake. How we save it.